Charles Darwin first puzzled over whether native species would help or hinder the invasion of related exotic species. Do natives make it hard for related invading exotic species to get established? Distantly related invaders might have an advantage in not being susceptible to many of the local pests and diseases, and, some may have novel traits that give them a competitive edge over the natives. On the flip side, Darwin also surmised that species closely related to natives would be most likely to have the right combination of traits to do well in the new environment. When in Rome, don't talk Swedish. 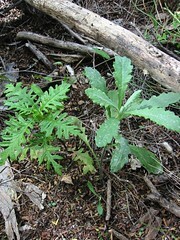 Knowing which of Darwin's two scenarios usually occurs in nature could prove useful for predicting new invasive weeds. Jeff Diez, a postdoc with the Bio-Protection Research Centre at Lincoln University, and colleagues, had a close look at this problem using the invasion of plants into Auckland. Their results were recently published in the journal Ecology Letters. The Auckland plant invasion is one of the best documented in the world, thanks to the work of several New Zealand botanists, particularly Alan Esler. When Jeff had a close look at Alan's data, he found that Darwin was right on both counts. It depended on the scale at which you examine the problem. Jeff and colleagues found that plants introduced to Auckland were more likely to go wild ("naturalise") if there were many related plants in the Auckland native flora, but less likely to naturalise if these native plants were abundant. When an introduced plant had naturalised, its abundance was related to the abundance of related natives. If natives were abundant in the habitat it was invading, the species would itself be less likely to become abundant. However, if related natives were abundant in other habitats in Auckland, the invading species would be more likely to become abundant. These results are consistent with introduced species that are related to natives being generally better suited to the Auckland environment than more foreign species. It is also consistent with related natives providing "biotic resistance" to this invasion where they are numerous in the habitat being invaded. It helps to know the local lingo but don't expect the natives to be friendly. Regrettably, this advance is likely to lead to only minor improvements in our prediction of weed invasions. Nearly half of the variation in naturalisation and 90% of the variation in subsequent abundance was found at the species level. This means that at the end of the day, each species is different enough from its relatives to be largely independent in its success as an invasive species. Jeff and colleagues conclude their paper by noting that "ultimately, we suggest that phylogenetic patterns of invasion may provide interesting insights into the organization of ecological communities, but only a limited basis for predicting invasions". Hey that's not fair, being able to invoke Darwin for both sides of your argument! I guess Darwin was just that good.